Why would anybody believe that God could sanction terrorism? Why has the rediscovery of religion’s power in recent years manifested in such a bloody way? What, if anything, can be done about it? Terror in the Mind of God, now in its fourth edition, answers these questions and more. Thoroughly revised and expanded, the book analyzes in detail terrorism related to almost all the world’s major religious traditions: European Christians who oppose Muslim immigrants; American Christians who support abortion clinic bombings and militia actions; Muslims in the Middle East associated with the rise of ISIS, al Qaeda, and Hamas; Israeli Jews who support the persecution of Palestinians; India's Hindus linked to assaults on Muslims in the state of Gujarat and Sikhs identified with the assassination of Indira Gandhi; and Buddhist militants in Myanmar affiliated with anti-Muslim violence and in Japan with the nerve gas attack in Tokyo’s subway. Drawing from extensive personal interviews, Mark Juergensmeyer takes readers into the mindset of those who perpetrate and support violence in the name of religion. Identifying patterns within these cultures of violence, he explains why and how religion and violence are linked and how acts of religious terrorism are undertaken not only for strategic reasons but to accomplish a symbolic purpose. 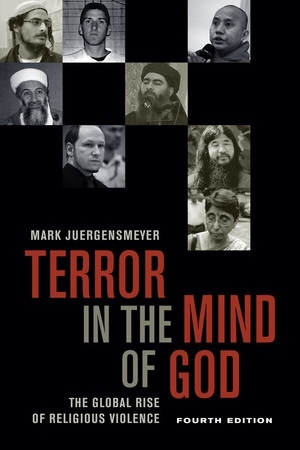 Terror in the Mind of God continues to be an indispensible resource for students of religion and modern society. Mark Juergensmeyer is Professor of Sociology and Global Studies and Founding Director of the Orfalea Center for Global and International Studies at the University of California, Santa Barbara. Can Buddhist Violence Be Justified?